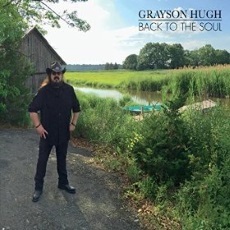 Grayson Hugh’s story is the story of the record industry at its best and worst. Most music fans learned of Hugh in the late 1980s and early 1990s after hearing his soulful baritone on the hit record “Talk It Over.” That cut found Hugh being a part of pop music’s recurring racialized theme when the video premiered on Vh1 and viewers saw that voice coming from that singer. Hugh’s star seemed to be heading in the right direction and his pedigree and training marked him as someone uniquely qualified to become a fixture on pop and urban adult contemporary radio. He parlayed the success of “Talk It Over” into the universally acclaimed Road To Freedom, an album that had two tunes featured in the film Thelma and Louise. Hugh then encountered the first of a series of professional and personal setbacks left him homeless and almost took his life. In 1992, a shakeup at MCA Records resulted in the A&R man who brought Hugh to the label being fired and all of the artists he brought to the label being shown the door as well. Hugh landed a job at the Berklee College of Music in Boston, but an addiction to prescription drugs and alcohol sent Hugh into a tailspin that resulted in him playing piano for his room and board a Cape Cod restaurant – a habit that nearly took his life. The slow road to recovery began in rehab when a counselor encouraged Hugh to use music to aid his recovery. Hugh eventually managed to begin writing and recording the tunes for his album An American Record with the help from some of his musician friends from the old days – including backup singer Polly Messer, who became Hugh’s co-producer and his wife. Now Hugh returns with Back to the Soul, his fourth solo project. Hugh’s life has all of the elements of a music biopic, from his slow and steady climb to fame, through the label politics that derailed his career, veering into self-destructive behavior and finally redemption with the help of good friends and the love of a good woman, and with Back to the Soul, Hugh already has the soundtrack. Hugh, like soul music idols Otis Redding and Marvin Gaye, is at his absolute best when wearing his heart on his sleeve and being totally transparent. In fact, Hugh goes way beyond keeping it real – he keeps it honest. With his feet firmly rooted in the soul and blues of Memphis and New Orleans, Hugh has crafted a record that is about as eloquently biographical as a music project can be. The gospel funk of “Rock ‘N Roll Man,” with its church inspired call and response conversation between Hugh and his backing vocalists, along with the percussive bass drums, hand claps and Hugh’s soulful organ playing, is a rollicking biography of the highs and lows of his life. When Hugh opens the song with the line “I was 17 when I left home/I had to leave/I had to roam,” he’s singing about his personal history. Hugh dropped out of school to pursue music. The song tells the story of his rise to stardom, fall due to shady music label politics and descent into darkness, with his love of rock music being the only constant. Hugh relies on the soulful chops that he acquired playing music in an AME church during his youth on the soulful ballad “Thank You Lord.” This biographical track finds Hugh telling the story of his struggle through the darkest period of his life and how those trials – even the near fatal ones – make Hugh the man that he is now. The years and ravages of time can be heard is his voice, which is still a rich and emotive instrument. However, that youthful baritone that could easily reach into high tenor range on “Talk It Over” is more ragged. But he’s lost some of his range and the vocals are deeper and raspier than in my first recollection. However, on a track such as “Thank You Lord,” the leathery vocals count as the hard earned wisdom of a life lived. So when Hugh sings about living above the barroom because “that’s all I could afford,” listeners feel the pain. And when he sings “It was out of there you led me/My journey had begun/I needed every stumble, drink and failure/Every one,” we know that this song is Hugh’s testimony. Hugh merges soul inspired vocals and musical arrangement with a country artist’s penchant for storytelling on “Already In Love With You,” a tune that tells the long journey that led him away from and eventually back to his wife. The one quality of Hugh’s career that stands out to me, besides his talent, is patience, and Back to the Soul is a patient record. Hugh is an expert storyteller who doesn’t rush his delivery. He allows the stories contained in his songs to unwind and that will bring a sense of satisfaction and a deeper appreciation of his struggles and gifts with each listen. This album beautifully completes a more than three decade story of a talented artist who, after too many years away, found his way back to his musical home. Strongly Recommended.